Mutants are a cornerstone fixture of the Marvel universe. If you have an ever-expanding universe of super people, the requirement to have an origin story for every one of them gets to be a bit daunting. Giving a percentage of the population super powers by birth solves that problem and opens all kinds of new interesting storytelling doors. Unfortunately for Marvel Studios, this essential aspect of their universe is currently controlled by Fox, so not only are some of Marvel’s best, most beloved characters off the table, but the whole idea of mutants is unavailable as well. As we’ve known for a while now, Marvel’s solution to this problem is to lean into the Inhumans and use these alien/human hybrids as a way to introduce a whole slew of super people without having to justify their existence one-by-one. Agents of S.H.I.E.L.D. has been playing with Inhumans for just over a full season at this point, and this week they’ve given us their most X-Men-ey Inhumans story yet. The main focus of this week’s episode is a summit of various world leaders gathered together to discuss the implications of the rise of Inhumans and how best to address this huge upheaval of our understanding of society. In attendance are Phil Coulson and his newly (and reluctantly) appointed partner General Talbot. With S.H.I.E.L.D. in the process of building a team of Inhumans, Coulson suspects that Gideon Malick and HYDRA are up to similar tricks and that Malick will attempt to manipulate this summit in order to get as many Inhumans within his reach as possible. Coulson’s suspicions are correct, but what he doesn’t know is that Malick isn’t the one calling the shots anymore. Instead, the reanimated corpse of Grant Ward is collecting Inhumans and doing… something to them. It’s not clear exactly what. In the comics, Hive was able to divide itself and control multiple hosts simultaneously, but here its powers are a little more ill-defined. It states that it cannot use other Inhumans as hosts, and though these Inhumans become loyal, they retain too much individual will to be enthralled servants. Either way, Hive has Malick in his pocket, and Malick in turn has someone at this summit in his. The question, then, is who. That’s exactly what S.H.I.E.L.D. is trying to figure out, but they’re having enough trouble trusting each other. The first point of contention is the return of an old nemesis: Crusher Creel – the Absorbing Man. 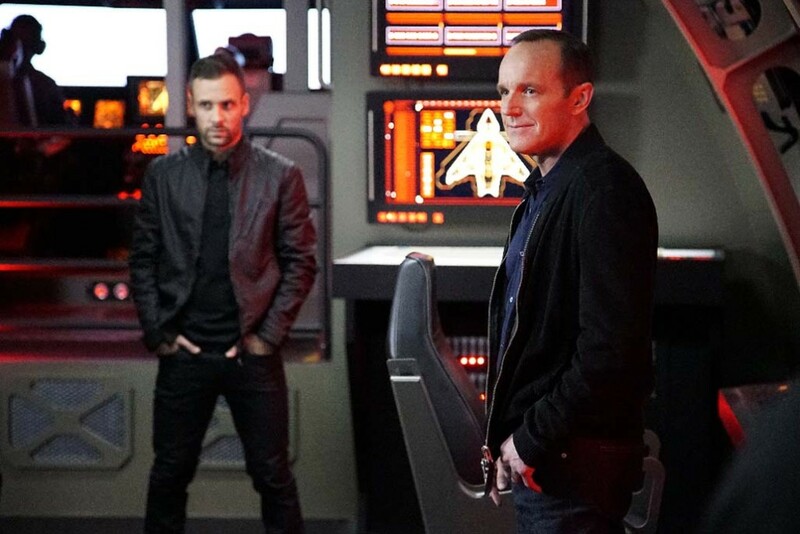 Talbot’s been using Creel as a bodyguard, claiming that the man has been reformed now that he’s been deprogramed from HYDRA’s brain washing, and with the rules of this summit forbidding both traditional weapons and the presence of Inhumans, this former murderer is the only real backup Coulson and company have if things at this summit go south. No one’s exactly thrilled about this idea, but Hunter takes particular offense to it. After all, Hunter joined S.H.I.E.L.D. back in Season Two only after Creel killed his friends and allies right in front of him. Meanwhile, May, who has already had to deal with the fallout from Hunter going off-mission for a personal vendetta, is having trouble trusting her fellow agent to stay focussed on the mission and not try to go after Creel. And on top of all of that, it turns out the representative in Malick’s pocket is none other than General Talbot, who is selling out Coulson in exchange for his Inhuman son in HYDRA’s custody. This chain reaction of mistrust works better on paper than it does in execution. While the character motivations all track when you write it all down, in the moment none of them are conveyed particularly well. It all feels somewhat perfunctory and manipulated, as if all of it was all some kind of ruse planned out ahead of time instead of the result of these characters reacting emotionally within the moment. Yeah, it makes sense for May to still be bitter about the way Hunter was willing to put her husband’s life on the line to go after Ward, but May’s decisions in the episode never feel like they’re motivated by this resentment. This is all supposed to be coming out of messy human emotions, but it’s all too neat and tidy. It becomes especially problematic when General Talbot’s double-cross becomes a triple-cross. The whole thing feels so scripted and planned out that I genuinely could not tell if Talbot’s betrayal of Coulson was a ruse or if his shifting allegiances were just opportunistic based on whoever had the most to offer him in any particular moment. I think we’re supposed to understand that Talbot was on Coulson’s side all along and played along with Malick in order to get his son back, but if that’s the case, it’s kind of a terrible plan. What does work, however, is the moral murkiness of the conversation the summit has on how to address the ‘Inhuman problem.’ The solution that is proposed is creating a ‘sanctuary state’ where the Inhumans can live ‘in peace,’ separate from the rest of the population. The issue is that while this sounds like a magnanimous solution, it’s a solution born out of fear – one that, at best, mirrors the woeful situation of Native American reserves in the U.S., and, at worst, calls to mind images of Japanese internment camps or worse. It’s forced segregation, designed to separate the fearful from the people they fear. This is the kind of stuff Marvel loves to explore with the X-Men, and it’s neat to see it here. Meanwhile, back at S.H.I.E.L.D. HQ, Daisy and Lincoln are having their own X-Men dilemma when Simmons discovers that Creel’s blood contains properties that suppress Inhuman DNA and prevent Terrigenesis from taking place. While it has no effect on people who have already transformed, it could be developed into a vaccine of sorts to inoculate those who have not yet gone through the metamorphosis. This discovery creates a schism between Daisy and Lincoln with the latter believing everyone deserves a choice of whether or not they want this life-changing ordeal forced upon them, while the former insists that Inhuman abilities are a gift and a birthright that no one should throw away. It’s fascinating that Agents of S.H.I.E.L.D. is framing the argument over this ‘cure’ as a metaphor for abortion rights, because it really drives home how messy and uncomfortable the whole argument is. Daisy believes that every Inhuman life is precious and that no one should be denied the fulfillment that comes with realizing one’s own potential, but Lincoln argues that becoming an Inhuman is a painful, difficult process, and for some it brings more agony than joy as they have to deal with the fact that their entire life has changed in ways they were never prepared for and have limited control over. Whichever side you come down on, each person is approaching this issue from a place of deep personal truth, and like abortion, neither side is likely to give up much ground to the other. Whatever else I think about the show, I’m excited that they’re taking on an issue this big. This is more thematically ambitious than anything they’ve aimed for on this show to date, and if they can pull it off, it could be just the shot in the arm this show needs. That said, they’re playing with fire here, and if they let this metaphor get away from them, things could blow up in their faces real quick. A topic this pointed and this heated requires a clear, coherent guiding hand that, quite frankly, this show has never once possessed. Even at its best, Agents of S.H.I.E.L.D. has always sort of shot from the hip and allowed things to realize themselves in a kind of loosey-goosey fashion. If they want to do a real, serious abortion metaphor this season, there can’t be anything loosey-goosey about it. I hope they’re up to the challenge.